So I've basically been in a rut for most of this year, as of now. The end result of my projects haven't really been fitting my expectations, so I've been severely lacking with the blog updates. As the semester progresses I'll have more work, for better or for worse. Hopefully for better! This piece isn't really close to being done yet. I've spent most the time establishing the lighting and values. It's actually a real pool I saw a few months ago and have been dying to have a go at, and I was fortunate enough to be able to incorporate it into one of my assignments. I'm debating adding another figure to help balance the composition. 100% photoshop. Feel free to crit! There's still some changes to be made/major refinement, but still. even though the ladder is pretty rendered, it feels fairly flat. Maybe approach it more like you approach the legs? They look great already. In terms of perspective, the angle that the pool has is funky, but I'm guessing it was just like that. The ladder doesnt sit on the edge of the pool well. Love how much your color and sense of form have improved dude. I'm sure your getting to it, but the surface of the water is'nt quite reading as water yet. That's the only major thing that needs to be tightened up. Can't wait to see the finished piece. Reiterating what Caleb said, there's something going on with the right side of the piece. 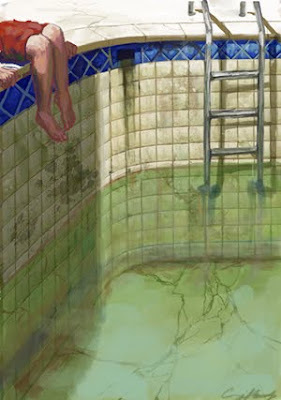 The ladder seems to stick out from the pool too far, and the angle of the pool's edge is strange. I think that could be because you lose the shadow from the ledge a little bit, so it looks like the blue tiles are sitting on top of the cement, or whatever the side of the patio around the pool is made of. But the left side feels really solid and believable, and the color of the water is nasty - in a good way. Why does that kid even want to go swimming in there? P.S. Somehow I think "Anonymous" is Zach. Maybe.